For Gynecologic Oncology Appointments with Dr. Nugent, please call 713-486-1170. 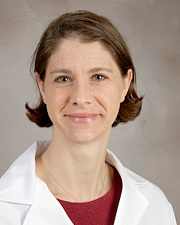 Elizabeth K. Nugent, MD is a graduate of Baylor College of Medicine in Houston, Texas. She completed her residency at Washington University School of Medicine in St. Louis, and a fellowship in Gynecologic Oncology at The University of Oklahoma Health Sciences Center. Dr. Nugent is board certified in Obstetrics, Gynecology and Gynecologic Oncology. Dr. Nugent’s clinical interests include the treatment of patients with cervical, endometrial and ovarian cancer, after-disease lifestyle modification and clinical trials for the treatment of gynecologic malignancies. She sees patients ages 16 and up and her practice philosophy is to treat each patient as an individual and to incorporate family members into treatment strategies. She feels that a team strategy is important in providing the best patient care. Her patients value her honesty and support. In her leisure time, Dr. Nugent enjoys spending time with friends and family, especially her children.